The United States on Wednesday recognized Venezuelan opposition leader Juan Guaido as the interim president, urging the overthrow of leftist President Nicolas Maduro following tainted elections and a spiraling economic crisis. In a coordinated bid to oust Maduro, Guaido declared himself acting president during a mass demonstration and within minutes was recognized by President Donald Trump as well as the Organization of American States. Under Trump, the U.S. has ramped up sanctions against the country that have contributed to its economic crisis. Venezuela has faced skyrocketing inflation and shortages of basic necessities such as food and medicine. Some 2.3 million people have fled Venezuela since 2015, according to the United Nations. The U.S. has previously supported the overthrow of left-wing governments in Chile, Nicaragua, Haiti, Hondurus, El Salvador, Cuba and Guatamala. In a Twitter Message, Maduro also noted supporters of his government also took to the streets on Wednesday to counter the mass demonstrations calling for his ouster. Earlier this month, Telesur, a Venezuelan-based media company largely funded by the country’s government, argued that National Security Advisor John Bolton is responsible for the U.S. push for regime change. Secretary of State Mike Pompeo explicitly called for Maduro to exit and said that Guaido would be considered interim president until a new election takes place. “The Venezuelan people have suffered long enough under Nicolas Maduro’s disastrous dictatorship. We call on Maduro to step aside in favor of a legitimate leader reflecting the will of the Venezuelan people,” Pompeo said in a statement. “The United States supports President Guaido as he establishes a transitional government, and leads Venezuela, as the country prepares for free and fair elections,” Pompeo said. Pompeo also renewed the Trump administration’s call for the security forces to intervene. A group of 27 soldiers rose up against Maduro on Monday but were quickly arrested. “We repeat our call to the Venezuelan military and security forces to support democracy and protect all Venezuelan citizens,” he said. On a briefing call with reporters on Wednesday, a senior U.S. administration official did not rule out American military intervention to support Guaido, saying “all options” are on the table. 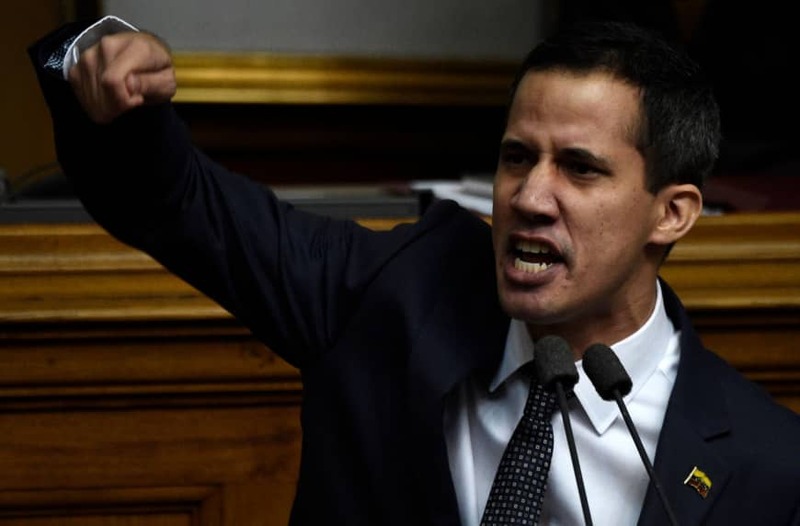 Guaido insists he has the constitution on his side but acknowledges he needs the backing of the 365,000-strong military, and has offered an amnesty to any personnel who disavow Maduro. NGO Citizen Control says around 180 soldiers were arrested last year for conspiring against the government, while 4,000 deserted the National Guard. Maduro, the heir to leftist firebrand Hugo Chavez, won a new term last year in an election widely criticized as tainted. Maduro was sworn in for a second six-year term after holding controversial early elections May 20.